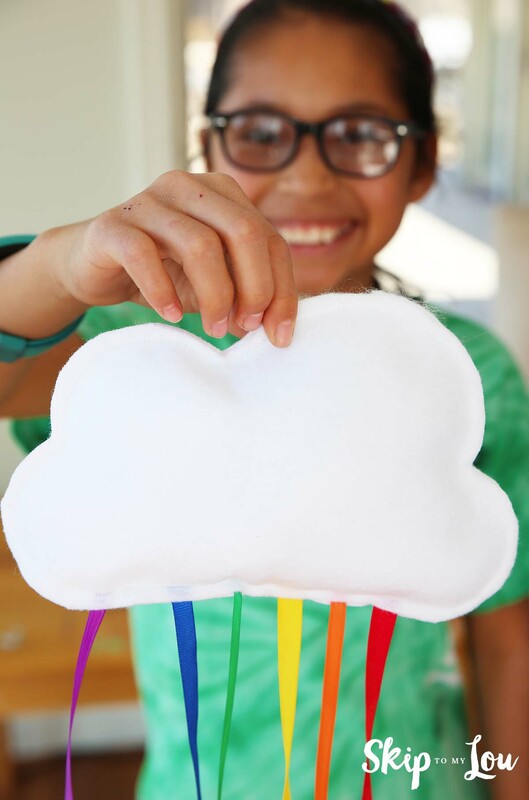 This hanging rainbow cloud is an easy sewing project for kids to decorate for St Patrick’s Day! They will be so proud to have made a decoration of their own! They go together so quickly Bella made a few for her friends! If you know a child that likes to sew or wants to learn please sign up for PinPal kids. We will let you know when the site launches in March. 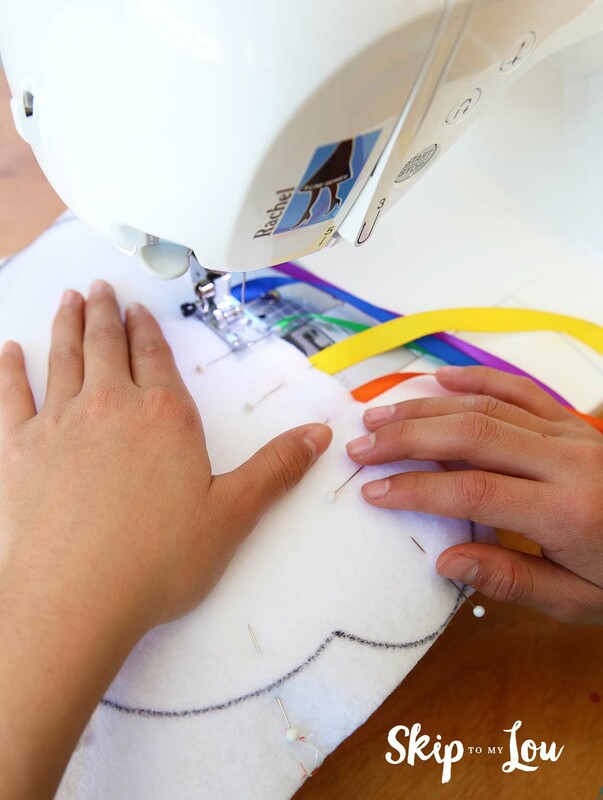 The site will be filled with simple sewing tutorials. Kids will make friends and share their projects! If they like they can even have a pal and sew a simple project and send it to each other! A win win…. they get mail (something kids rarely get these days) and create a community while learning a valuable skill. 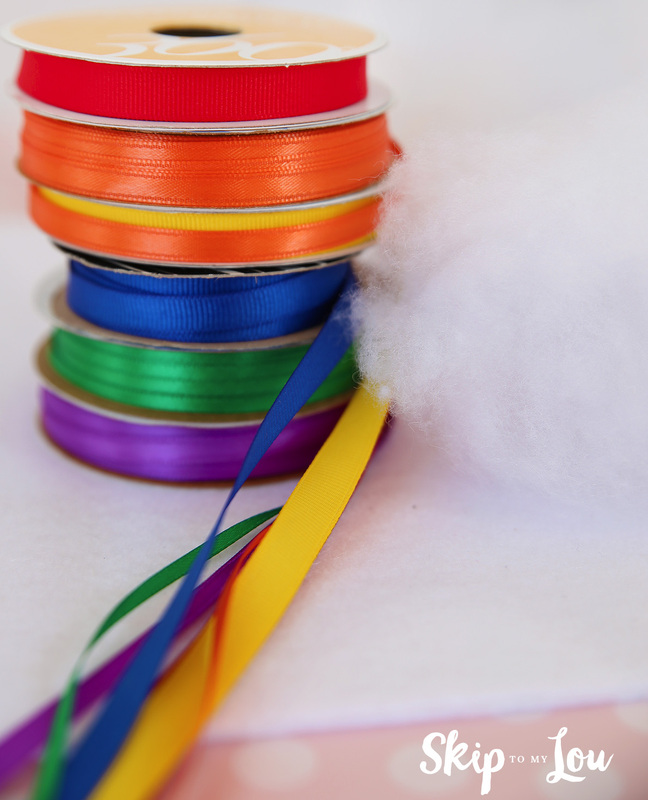 A rainbow of ribbon. We used what we had on had. If I was purchasing ribbon for this project I would probably chose wider ribbon. 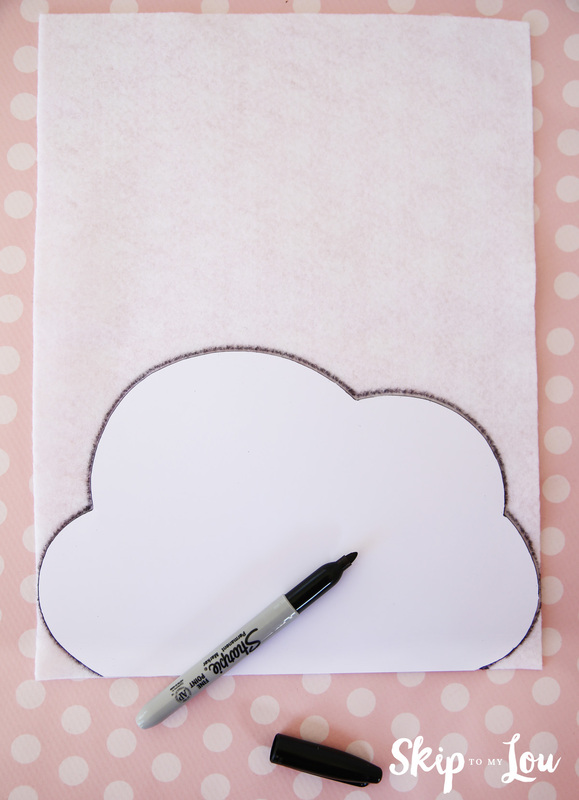 Download the cloud template and print. Draw around the template with a marker on the felt. It is important that the bottom of the cloud line up with the bottom of the felt. 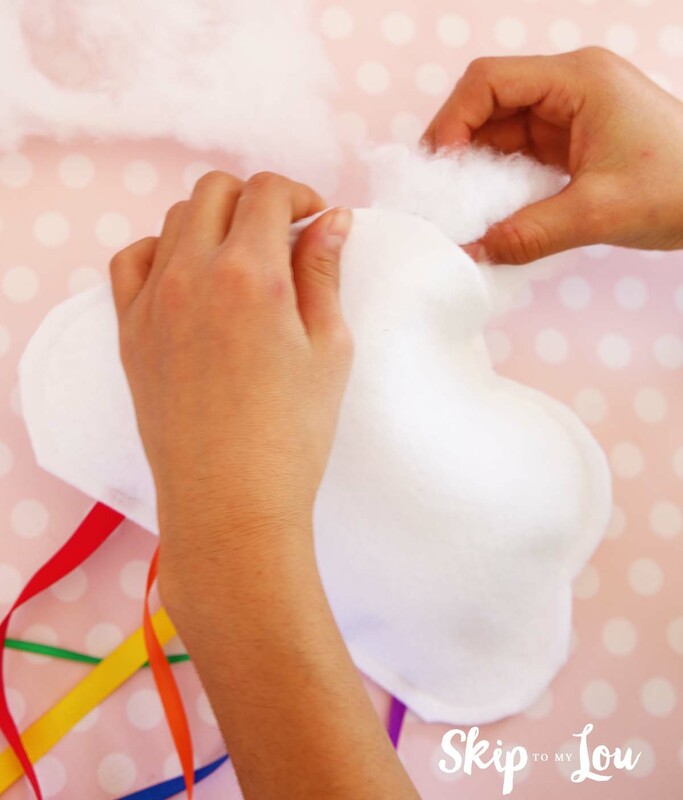 Fold the piece of felt in half or if you are making two clouds lay the drawn piece on top of another piece of felt so you have two layers. Cut ribbon in desired lengths. Bella wanted hers long! 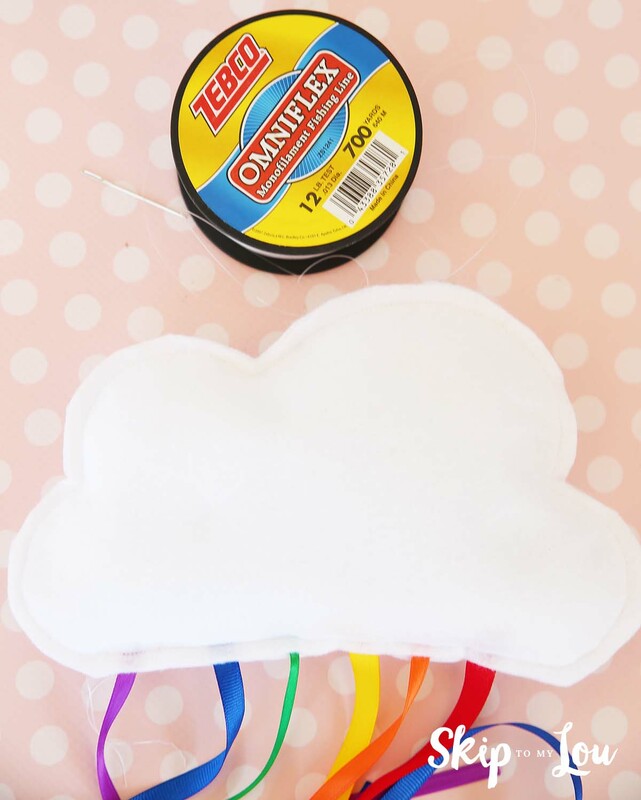 Pin the ribbon between the layers of felt across the bottom of the cloud. Pin all the way around the cloud. Be sure to leave a spot open to add the stuffing along the top. Sew all the way around the cloud with about 1/4 inch seam, leaving a small two inch opening. Start sewing at one side of opening all the way around to the other side of the opening. The red dots show where Bella left her opening. Cut out the cloud removing the marking. Be very careful to not cut the stitching line. Fill cloud with stuffing. Once cloud is nice and fluffy, with the sewing machine stitch the opening closed. One cool cloud (and little girl)! With the tapestry needle pull a length of fishing line through the top of the cloud. Tie a knot. Make line as long as you need to hang from your ceiling. 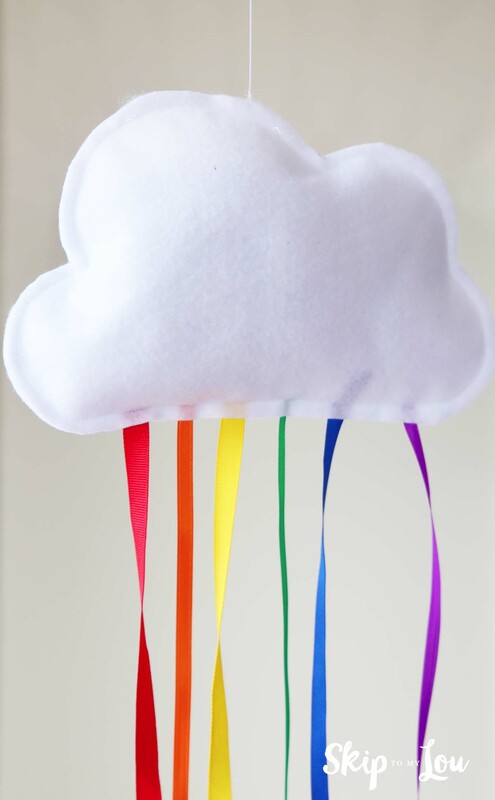 Want more rainbow crafts? 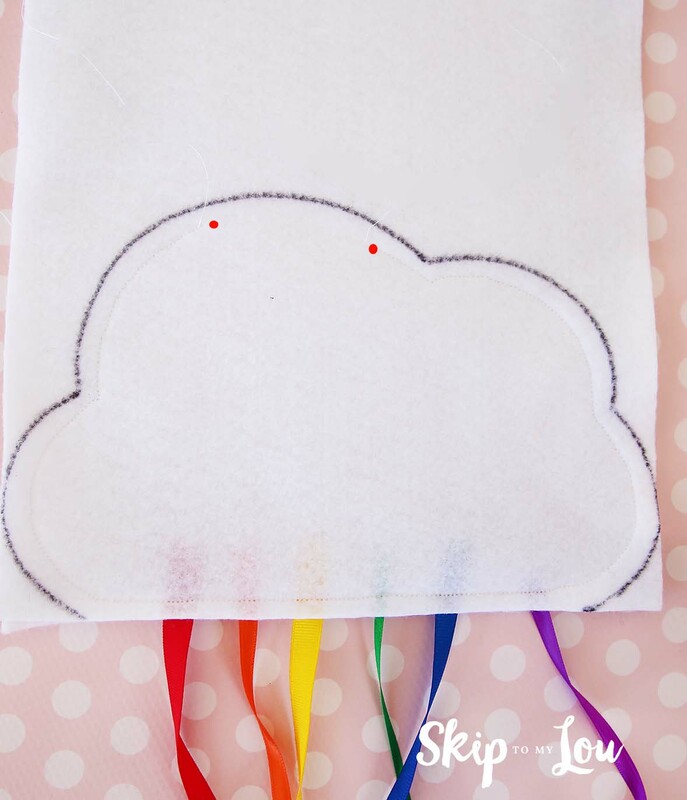 These rainbow crafts are very fun and easy. Did you child have fun with this project? 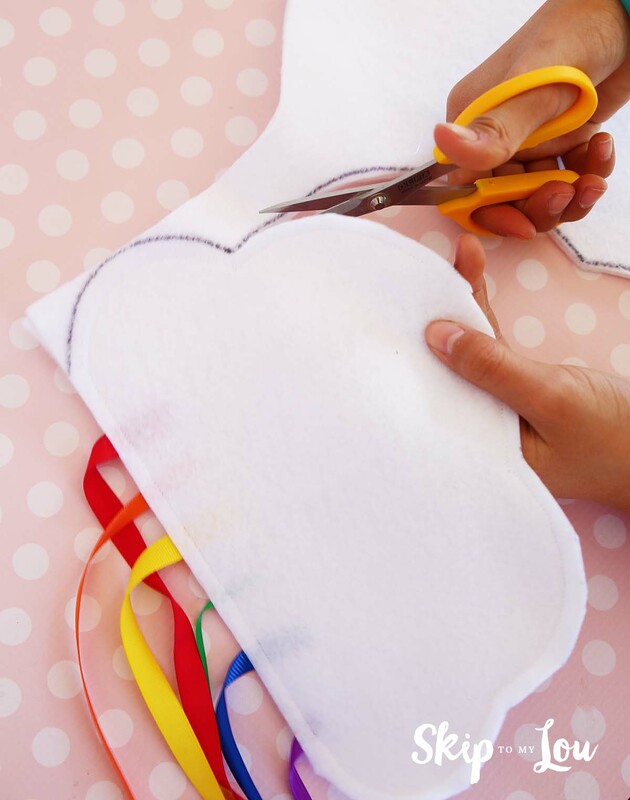 Check out these easy beginner sewing projects. I really like this idea! Cute and easy project. My grandchildren aren't quite old enough to sew, but I may make some of these for their bedroom myself. Thank you for sharing it with us! 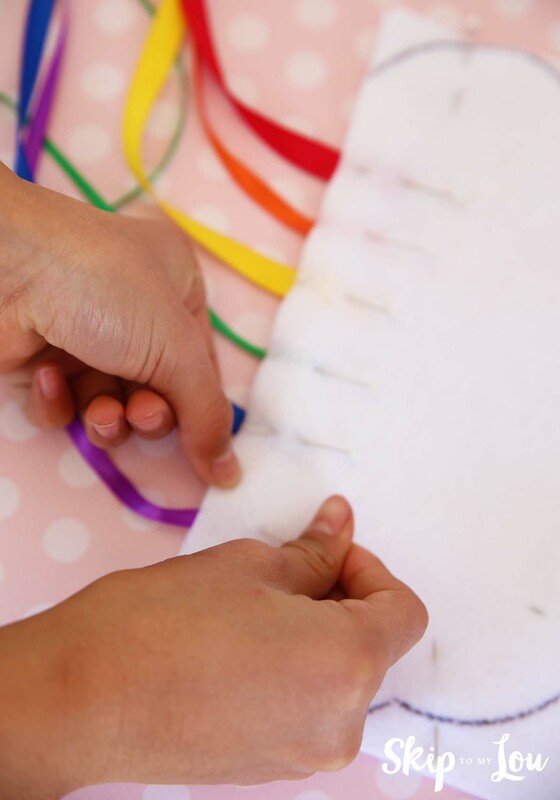 This is a very cute project, and I absolutely love the idea of passing down the art of sewing to the next generation!